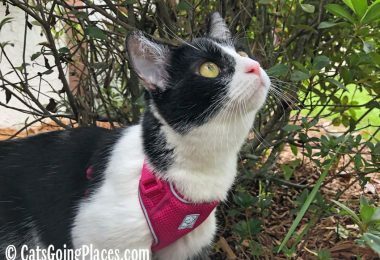 It’s easy to forget that a cat is wearing a fur coat the whole time the two of you are out in the summer heat, and she can only sweat from the pads of her feet. 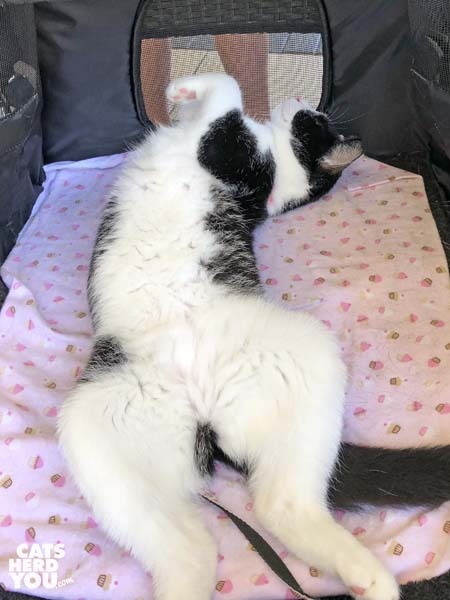 That isn’t a lot of area for cooling, and it’s a lot easier for your cat to overheat than you might realize, especially if she can’t get into the shade. Cupcake’s solution to hot Florida weather when she is outside is to let any breeze cool her from underneath. 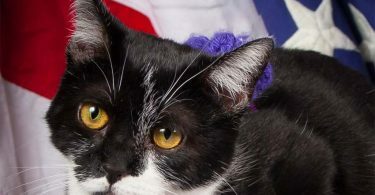 If your cat overheats in warm weather, she loses fluid as her paws sweat, trying to cool her, and this can result in dehydration. 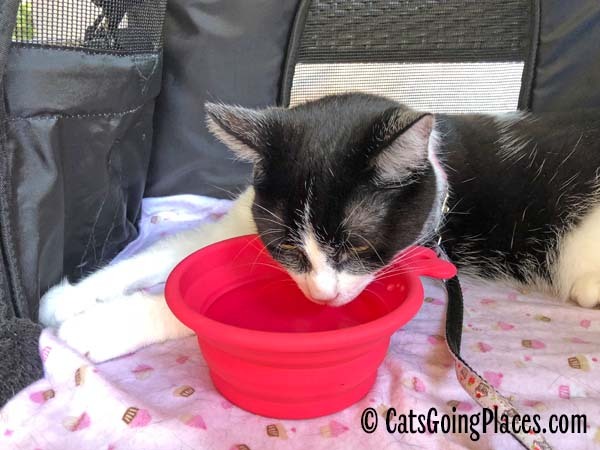 When you and your cat are out in hot weather, it is important to have water available, and to offer it to your cat often. 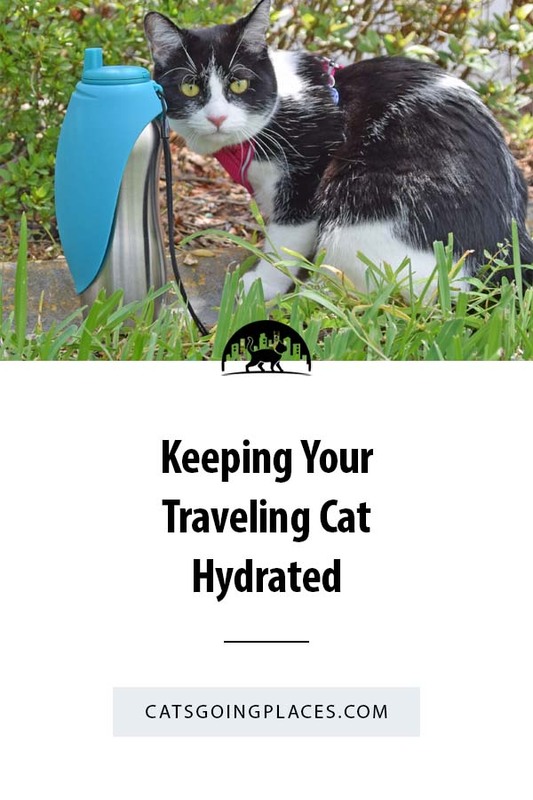 Unfortunately, having relatively few cats going places means there aren’t cat-specific products for travel hydration. Instead, we turn to solutions originally designed for dogs on the go from Messy Mutts. 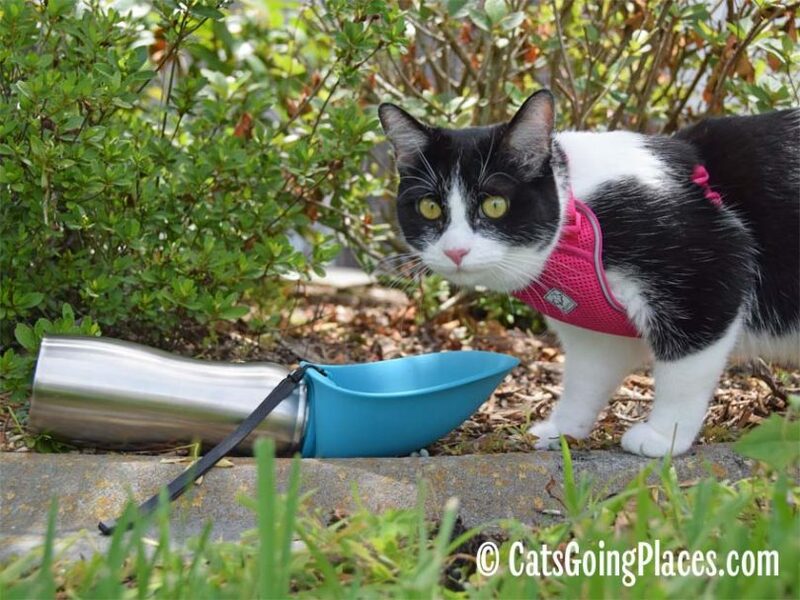 Luckily, solutions to help pets have enough to drink on a hot day work for cats as well as they do dogs.  It folds down flat so it fits inside the pocket of your cat carrier, gear bag, or purse. 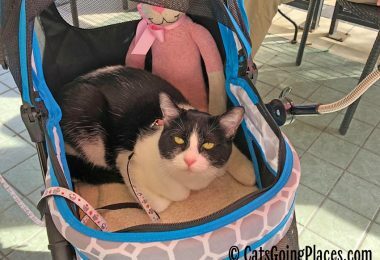 It also has a carabiner clip included so you can attach it to the outside of your cat’s carrier or your bag when it is wet. That helps keep the inside of your bag dry after your cat has a drink. 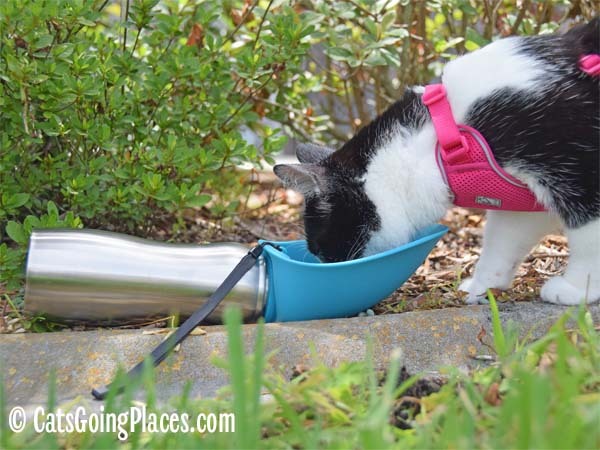 I really like the Messy Mutts collapsible bowl because it’s made of food-grade silicone, so it’s safe for your cat to drink or snack from. The rim of the bowl is reinforced with some kind of metal, which keeps it from breaking or deforming if you really cram your bag full or sit on the bag while the bowl is inside. If you’re going somewhere that water isn’t readily available, it’s important to bring your own. This can get awkward, but Messy Mutts has made it really easy with their stainless steel travel water bottle with oversized silicone flip-up bowl. The Messy Mutts water bottle with flip-up bowl is a stainless steel water bottle like you might use to store your own water when you go out. It is even sized the same way, so it fits in your bag’s water bottle holder. The difference is the bottle’s lid, which integrates an attached silicone bowl for dispensing water while you’re on the go. The silicone bowl folds down along the side of the bottle like a half-sleeve that you can unfold when it’s time for your cat to drink. Dispensing water is easy. You just press a big button in the middle of the lid to unseal the water, then tip the bottle so the water can spill into the attached bowl. 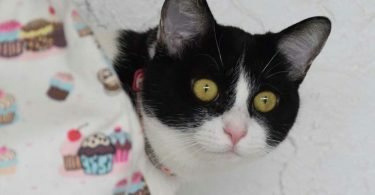 When your cat is finished drinking, pressing a second button reseals the water so it won’t spill out by accident. Then you can fold the silicone bowl back along the side of the bottle for compact carrying. 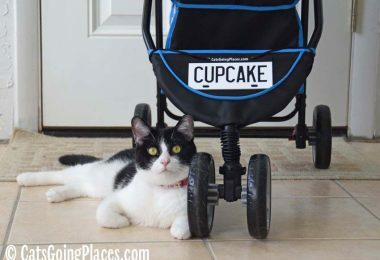 With a little planning ahead from you and a little help from MessyMutts, your cat will be sure to always have something to drink no matter where your adventures take you together. FTC Disclosure: I received the MessyMutts bowl and travel water bottle for review at no charge. This didn’t influence what I said about the product. All opinions in this review are my own and not influenced by any outsider. I receive no additional benefits for talking about the products or company. These are really handy tools. 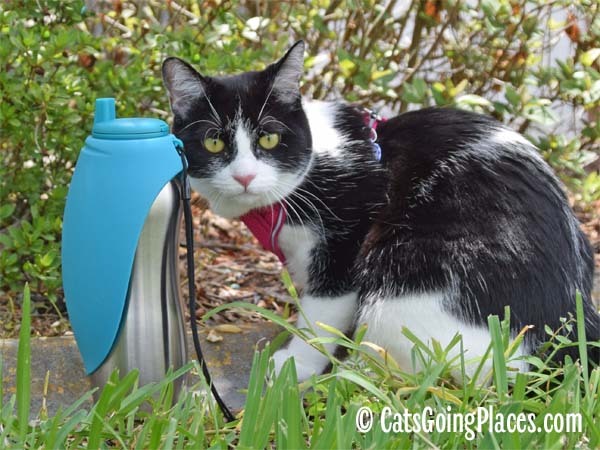 My human needs to get one of those water bottles. That water bottle looks great. I have a silicone bowl that I use now.